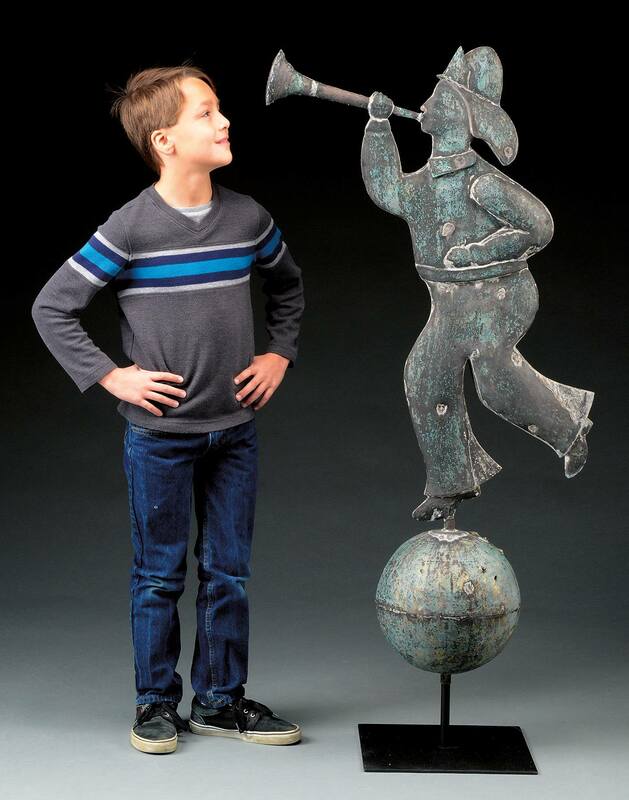 James D. Julia's February Fine Art, Antiques, and Asian Auction Warms The Winter With Sales Topping $3.1 Million! Cold temperatures were no deterrent to bidders who could not get enough of the almost 1,400 lots of world-class fine and decorative arts, antiques, folk art, Asian articles, historical items, and archives on offer. I was happy to see such enthusiastic bidding across all categories over the course of this three day sales event. There was great interest in our selections of fine paintings and weathervanes, and both categories did quite well. The 2016 auction season has been officially launched, thanks to James D. Julia's amazing three-day mid-winter sales event. After the hammer fell for the last time, 36 lots realized $10K or above. In addition, 8 lots realized $25K or more, and 3 lots broke the six-figure mark! Day one hit the ground running with over 260 lots of outstanding paintings and fine art selections. 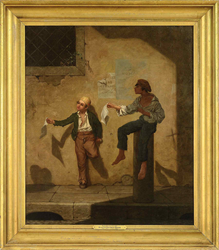 Museum-quality sales highlights included Martin Johnson Heade's deeply symbolic Roman Newsboys II, which made headlines at $189,600; Howard Terpning's Searching the Mountains, which found $124,425; and German American artist Hans Hofmann's Abstract in Colors '42, which realized $94,800. 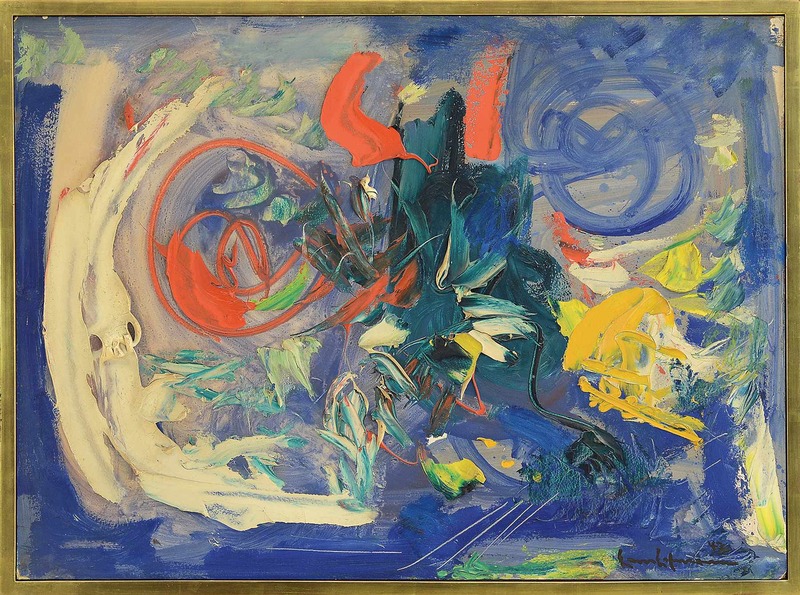 Julia's is internationally recognized as the leading authority on Rockport school paintings as well as works featuring Maine artists and themes. Enthusiasts found the outstanding selections of both on offer oceans apart from any other auction house. 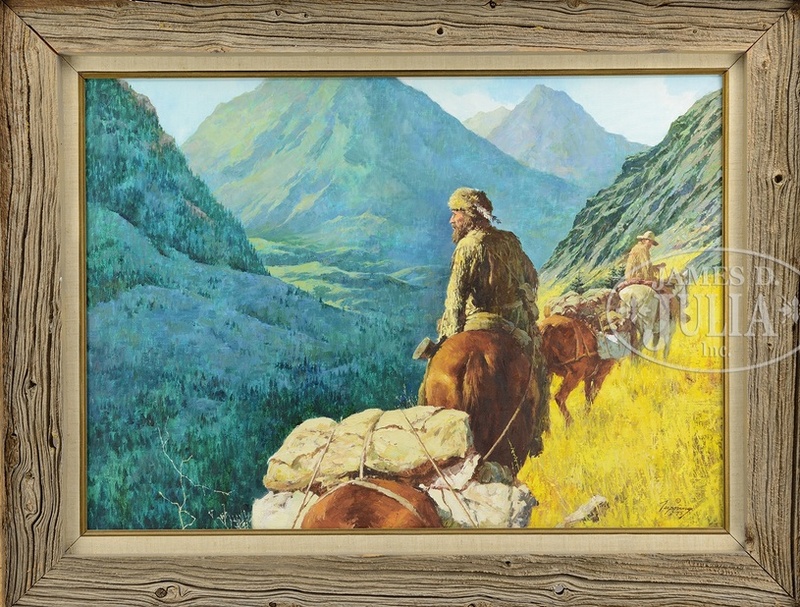 The sale presented several Aldro Hibbard paintings, with his impressive Canadian Rockies reaching the summit at $17,925. And lot 1030, Emile Gruppe's Gloucester Morning was an early hit, realizing $11,850. Top Maine picks included a tranquil interior scene of two women arranging flowers by Abbott Fuller Graves, which realized $13,628, and Walter Schofield's Coast of Maine, which realized $27,338. Day one also included a highly curated selection of other fine works. Lot 1160, Paul Cezanne's The Large Bathers, cleaned up nicely at $10,665. But it is safe to say the heavy hitter here was a bronze attributed to Edvard Munch and signed "E Munch." Titled Sostrene, this never-before-seen sculpture depicts two women’s heads - possibly the Meissner sisters, Olga and Rosa. After much back and forth among bidders, this Munch mystery realized $18,225. Day two was “standing room only” with the auction hall filled with over 100 bidders, and the parking lot overflowing onto the nearby highway. Auction day two featured over 650 lots of outstanding American and European antiques, furniture, and accessories. There was no time out for bidders pursuing this sale's comprehensive selection of extraordinary tall case clocks. Lot 2121, an Important Simon Willard Federal Mahogany Tall Case Clock; lot 2106, a Chippendale Cherry Tall Case Clock by Peregrine White; and lot 2078, a Mahogany Chippendale Tall Case Clock by Thomas Harland, were up to the minute highlights, realizing $26,070, $16,590, and $13,035, respectively. Knock on wood, Queen Anne furniture was another key category in this sale. Bidders gave the royal treatment to lot 2068, a very fine cherry Queen Anne Tray Top Tea Table, which realized $14,580, and lot 2069, a set of six Queen Anne Compass Seat Side Chairs, which realized $9,480. It was all hands on deck with this sale's fantastic selections of nautical art. There was a boatload of interest in three paintings in particular. These included lot 2061, an early 19th century portrait of the ship Amity, which realized $25,477.50; lot 2062, Solon Francis Montecello Badger's portrait of the schooner Bessie C. Beach, which realized $9,480; and lot 2064, Antonio Jacobsen's Gloucester Fishermen on The Banks, which realized $8,295. This sale presented collectors who insist their acquisitions have a distinctly historical context some truly breathtaking and once in a lifetime opportunities. Several incredible rarities had their origins in the founding of this great country. These included lot 2026, an extraordinarily rare and historic Revolutionary War Powder Horn used by Minuteman Oliver Buttrick at the Battle of Concord, which realized $88,875; lot 2002, a Samuel Drowne signed silver American Revolutionary War Eagle-pommel Officer's Sword of Captain Samuel Storer, which realized $24,292.50; lot 2006, a fine French and Indian War Powder Horn and Commissions of Abner Curtis, along with his Revolutionary War Commissions, which realized $18,960; lot 2071, a fine pair of coin silver tablespoons by Paul Revere Jr. that realized $10,665; and lot 2010, a Revolutionary War-era tricorne hat, which realized $12,442.50. These fine investment quality items will certainly stand the test of time. Collectors were clearly blown away with this event's fine offering of early weathervanes. 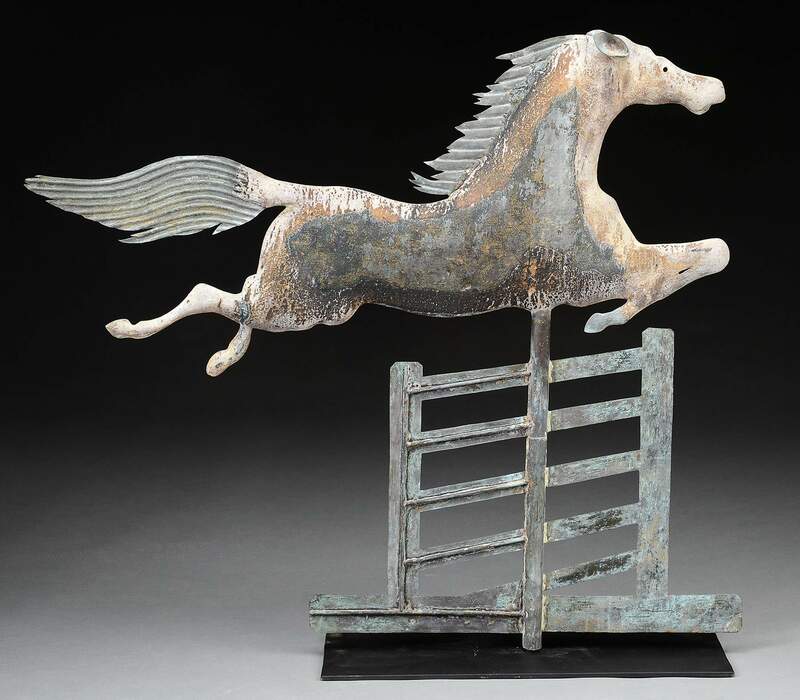 Lot 2091, an early, rare, and untouched steeplechase Horse Jumping Over the Gate Weathervane, won the race at $112,575. Also in the spotlight was lot 2107, a rare and important monumental full-bodied Fireman Weathervane retaining its natural verdigris surface. When the smoke cleared, this barnburner realized $94,800. Other highlights included lot 2090, an over-sized Cow Weathervane. possibly by Harris & Sons, which realized $13,627.50 and lot 2180, an over-sized Leaping Stag Weathervane, attributed to Washburne, which realized $9,480. An auction would not be an auction without a surprise or two, and this mid-winter sale really delivered in that respect. Bidders gave their stamp of approval to lot 2348, a rare 2013 Jenny Right-Side-Up 6-Stamp Block of the Jenny inverted stamp, which realized $59,250. This modern rarity, created to celebrate the historical misprint of this original stamp in 1918, is only one of possibly 77 out of 2.2 million sheets produced, and was purchased down the road in Waterville, ME, in 2015. Other fine categories and items featured during the second day of this comprehensive sale included rugs, stoneware, accessories, antique silver, and Object d'Art, among many others. Julia's third auction day was dedicated to Asian Art, and realized over three quarters of a million dollars in sales - again confirming Julia’s position as the emerging leader in this these most important categories. This sale offered several very unique Asian treasures, which really resonated with buyers. 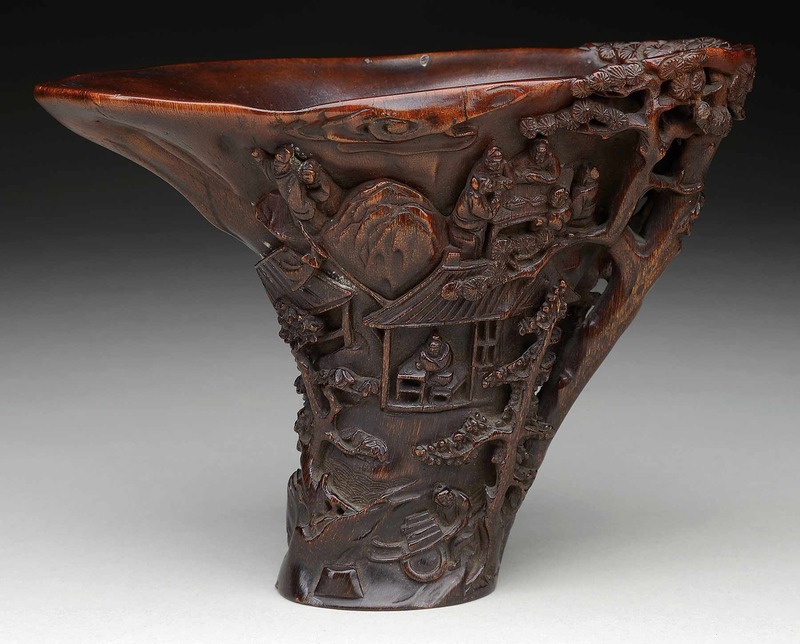 Leading the charge was lot 3268, a finely carved Large Rhinoceros Horn Scholar Landscape Cup, which realized $56,287.50. 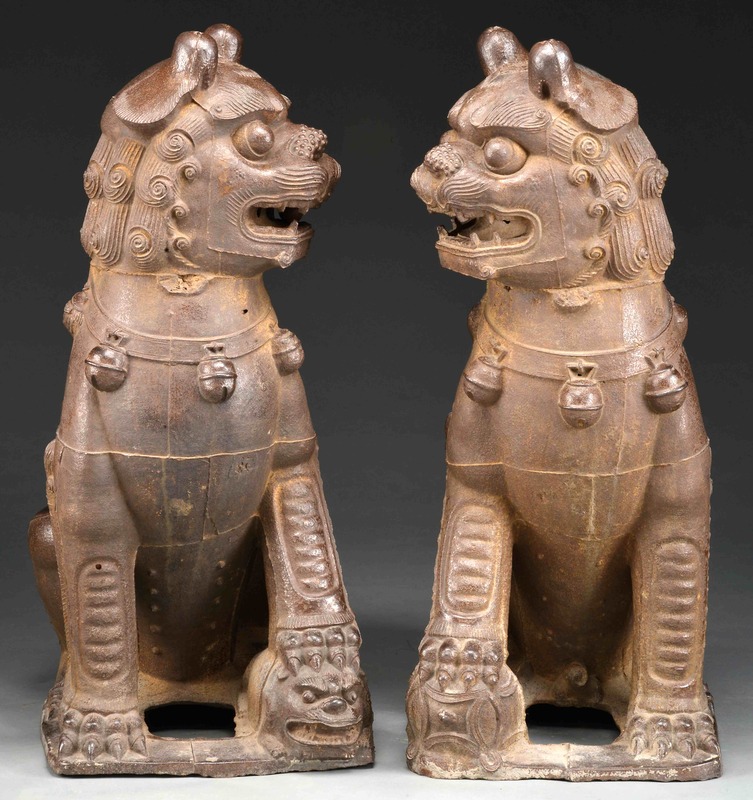 And lot 3092, a monumental pair of Cast Iron Buddhist Lions, roared to $47,400. Buyers really lit up over this sale's expansive offerings of censers. Three highlights included Lot 3203, a rare Guanyao Tripod Censer, which realized $23,700; lot 3170, a Jiaotan Guanyao Censer, which realized $15,405; and lot 3169, a Ge-Type Tripod Censer, which realized $12,442.50. Jades also sold well at this auction event. Various forms were on offer, with many exhibiting exceptional carving details and coloration. Lot 3091, a Mottled Yellowish Jade Carving of a Carp, realized $24,885, while lot 3136, Jade Plaques For A Belt, wasted no time in realizing $4,977. And lot 3279, a Spinach Green Jade Brush Pot, realized a healthy $7,110. Julia’s selections of porcelain items on offer were second to none, and buyers could not get enough of these precious Asian rarities. Lot 3196, a Ge-Type Pear Shaped Vase, realized $23,700, while lot 3211, a Famille Rose Porcelain Panel, blossomed at $23,700. Other highlights included lot 3200, a Ge-Type Bottle Vase, which realized $20,145; lot 3198, a Guan Quatrefoil Planter, which realized $18,960; and lot 3164; a Ge Ware Foliate Brush Washer, which came clean at $16,590. According to Bill Gage, Department Head of James D. Julia's Fine Art, Asian, and Antique Division, "I was happy to see such enthusiastic bidding across all categories over the course of this three day sales event. There was great interest in our selections of fine paintings and weathervanes, and both categories did quite well. Our next will be held in August 2016, and our team is already accepting consignments for what many people consider the highlight antique auction of the summer." James D. Julia, Inc., one of the top ten antique auction antique houses in North America based on annual sales, is headquartered in Fairfield, Maine. The company also has an office in Boston, Massachusetts. In business for over 40 years, the company conducts high-end antique, collectible, and decorative arts auctions throughout the year. Julia's has routinely establishes new world records through its auctions. The company consists of three divisions, including rare firearms and militaria; fine and Asian art and antiques; and rare lamps, glass and fine jewelry. Each division is regarded for its excellence and is staffed with world-class specialists to insure fair and professional authentication, identification, and valuation services. For more information on James D. Julia, Inc., please visit http://www.jamesdjulia.com.